Louis Garneau USA of Derby, Vt., is recalling about 1,200 bicycle helmets sold in the U.S. and Canada. The helmets do not comply with the impact requirements of the federal safety standard for bicycle helmets, posing a risk of head injury. This recall involves Louis Garneau Course Helmets with model number LG1261 printed on the inside of the helmet. 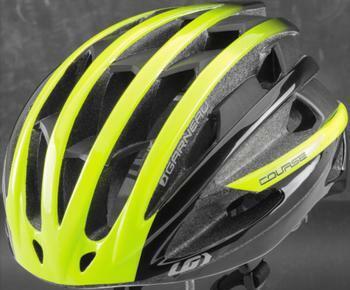 “Garneau,” “Course” and “LG” are printed on both sides of the recalled bicycle helmets. They were sold in matte black and matte fluo yellow. The manufacturer’s date and serial number are printed on a sticker inside the helmet. The helmets, manufactured in China, were sold at authorized bicycle dealers nationwide from December 2015, through January 2018, for between $180 and $240. Consumers should immediately stop using the recalled helmets and contact Louis Garneau for instructions on how to receive a free replacement helmet. Consumers may contact Louis Garneau at 800-448-1984 from 8 a.m. to 6 p.m. (ET) Monday through Friday or online at www.garneau.com/us/en/ and click on “Customer Notices” near the bottom of the page for more information.